I’ve been seeing the James S. A. Corey name on science fiction books for a few years and just hadn’t had time to take on one of those monster doorstoppers. After reading this novella, I’m more inclined to pick one up as soon as school lets out for the summer and I have more time. Looking forward to that. 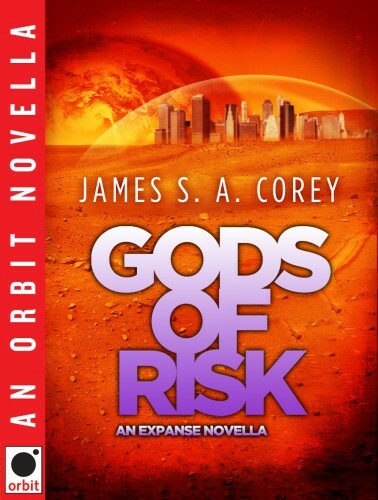 Gods of Risk isn’t that enthralling, but the prose is highly readable. Unfortunately, the pedestrian plot doesn’t really spark any suspense either. Once the setup is in place, with all the players on their marks, the story is really predictable. In fact, it could have probably been written in half the pages the author(s) uses. I liked David’s character overall because he’s a kid any reader can understand. He’s in over his head and up against a bad situation he never saw coming. If the plot had stayed focused on that, and if David had been smart enough to get himself out of the threat, the story would have been more interesting to me. Instead, another character comes to the forefront and takes over the action. That sequence is more for setting up the next book in the Expanse series than anything else, in my opinion. The book meandered a little too, bringing in David’s family and some existential thinking that takes the edge off the suspense story. The development of the Martian background and the Mars/Earth complications are interesting and well-done, though, but didn’t have anything to do with David’s story. Overall, I’m really encouraged to read more books in the series and see what else is developing, as well as what has gone on before. But I think I’d suggest starting at the beginning of the series, which is what I plan on doing now. This entry was posted on April 19, 2013 at 6:38 am and filed under Crime,Novella,series fiction,SF. You can follow any responses to this entry through the RSS feed. You can leave a response, or trackback from your own site.